About a 45-minute drive from most central areas of Costa del Sol. Worth the trip ?. Yes, absolutely in my view. A course that far out some people might say is not really Costa del Sol anyway, more a local enclave of golf for people who have bought or rent property in that 'ínland' area (and happily spend the majority of their time quite isolated there). The clubhouse I find simple and charming in an old-style way. Pleasant courtyard derived from original farmhouse many years ago. The Lauro course itself is flat and easy to walk. The 3rd 9 holes here were added after the original 18, and in my view are not up to the same standard as the first 18. They are more cramped, more repetitive (repeatedly up and down the hill next to each other) and simply less interesting. Try to get on to the original 18 the first few times you go there. Then consider the 3rd 9 later. The entire course is inland in a quite fertile valley surrounded by rolling hills. This makes a difference. Remember Spain is a dry country. A lot of golf courses are built on ground with thin and stony topsoil. To lay down a fairway, they have to layer lots of imported earth. Lauro is not like that. To understand what I mean, take a large divot on the course. The rich red fertile soil underneath is natural – and rare on the Costa del Sol. This is not just a theoretical issue. For some golfers (particularly the better ones) it means they can strike down through the ball with accuracy exactly as they want to. 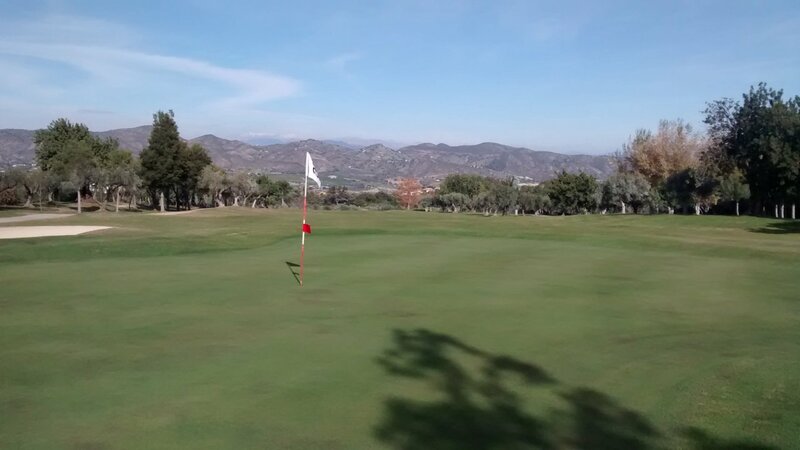 The greens at Lauro are quite large, mostly flat and about half are elevated. The quality of the greens is acceptable, but not excellent. Smooth, but with a number of muddy patches in Winter which dry out to bald patches in Summer. Personally I think they need to introduce more sand into the greens to improve the drainage. The fairways and bunkers are OK, although there are quite a lot of divots in the fairways. Some of these are sanded (presumably by staff) , but the grass in not growing back in those holes. Lauro needs to figure out a better divot repair system e.g. perhaps some grass seeds in the sand they put down. Quite an easy course, so definitely suitable for high-handicap players. Low-handicap and mid-handicap players like this course because it is a nice place to construct a good round. Wild shots not often punished. 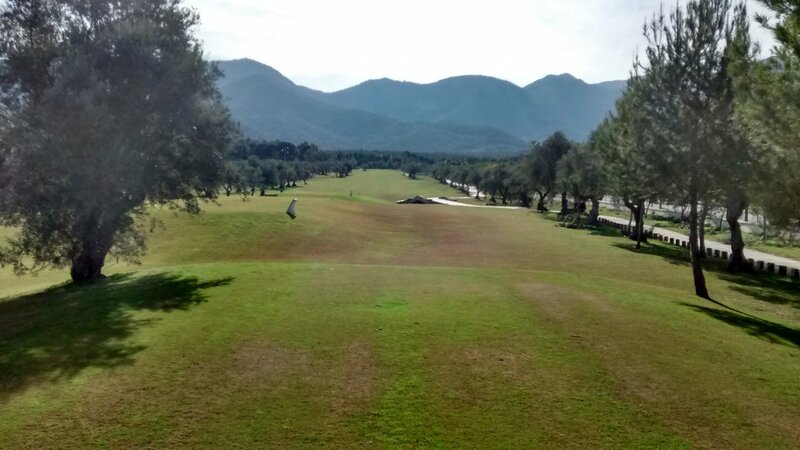 Quite the reverse – shots up to 10 meters off your fairway can still be quite playable. In summary, not a challenging golf course and very pleasant atmosphere and feel to the place. A nice relaxed 'day out in the country' for me. I do however have an issue with the marshal (ranger) on this course. The guy should make the effort to be more polite and friendly. Everyone understands and respects what the marshals do when going around the course, but that is no reason to be Mussolini rather than Mandela. Note about trees: I also particularly like the tree-planting on this course, around the tee boxes mostly. Whoever did the original tree planting on Lauro did a nice job. Most trees there are now about 4 meters tall. Once they grow up to 8 meters, people will really notice how much they add to the natural beauty of this course. Review last updated: January 2015. Number of times played: 6. The Lauro 9-hole combination A+B is represented by the yellow dot. The Lauro combination B+C is represented by the brown dot. This just shows that the C 9-holes are a bit shorter, and quite a bit easier, than the A and B 9 holes. 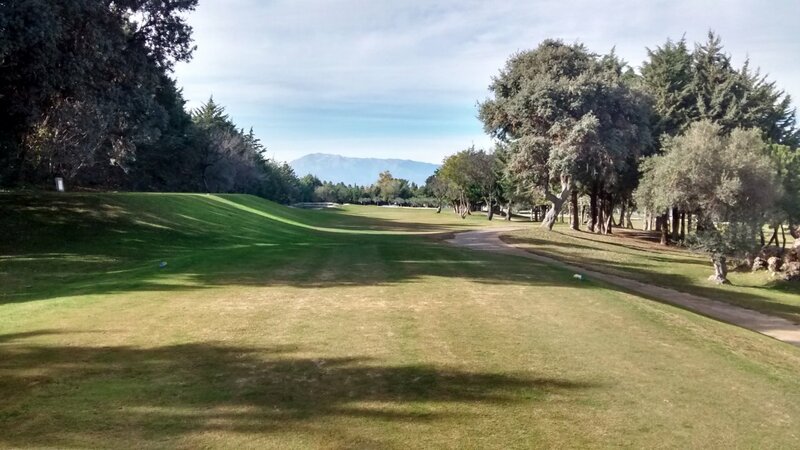 Overall, Lauro is about average difficulty and length compared to all other courses on the Costa del Sol. An 18-handicap player can expect to go around this course between 19 and 20 over par.